You've found London's most respected, trusted and accredited PASMA, IPAF and safety training providers! Based just outside London in Hornchurch, Essex, we have a wide range of IPAF, safety, ladder and PASMA training courses; all overseen and provided by experienced and time served instructors and trainers. Whatever type of training you need, we'll provide comprehensive training courses that help you and your employees better and more safely use any first aid, working at height or safety equipment. As one of London's leading PASMA and IPAF training providers, we have decades of technical expertise and practical experience. 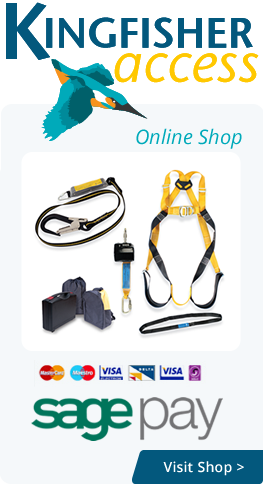 Meaning you can be safe in the knowledge that you and your employees will be expertly and correctly trained to easily and safely use all working at height, first aid and safety access equipment. It's incredibly quick and easy to book a place on one of our PASMA or IPAF training courses! So if you know which training course it is you need, simply visit our 24/7 course selector and booking form - it's as simple and painless as that! All our PASMA training courses include hands-on practical demonstrations, as well as 3T and Advance Guardrail assembly and dismantling assessments. So if you're based in London or the surrounding area and want proven, reliable, trusted and PASMA approved training for you and your staff, look no further than the PASMA training experts here at Kingfisher Access. As one of London's leading IPAF training providers, the standards we set here are accepted everywhere across the City and the rest of the UK. We are fully IPAF approved and accredited and the Powered Access Licence you will receive upon completion of our course will carry true weight throughout the industry. Our experienced and fully qualified instructors and trainers will also make sure that you and your staff get the very best out of every single piece of equipment safely. Even with the massive advancements in technology across the globe, ladders and step ladders are still some of the most commonly used products and equipment by construction operatives across London and the rest of the UK. This is why it is so important that the proper selection, training and inspection is undertaken. Provided by our fully qualified and experienced trainers and instructors, our ladder training courses are essential for business owners, users and supervisors alike; so book your place on our ladder training courses today! If you've found the most ideal ladder, PASMA or IPAF training course for you and your employees, just visit our 24/7 booking section and course selector. Then fill out your details to book your place on any of our comprehensive training courses today. We understand that sometimes it can be difficult to arrange a suitable time for you or your staff to leave your business to undergo required safety training. This is exactly why we run our PASMA, safety, ladder and IPAF training courses every day of the week and also during weekends and evenings and even overnight courses too. So if you're based in London or anywhere else across the Home Counties, speak to the PASMA, safety, IPAF and MEWP training experts at Kingfisher Access today. Simply book your training course via our 24/7 booking system or contact us for more information.